Finally (whisper it) it looks like spring has arrived. Time then, for a round-up of some of the better vegetarian recipes that have featured in recent weekend supplements and more. As soon as light nights come around I’m all for leaving aside the root vegetables and spicy stews of winter and marching into the warmer weather with a light supper. This ‘salad’ from Paul Rankin over at the BBC could work, I suppose, as an accompaniment to a heartier dish – Rankin suggests grilled halloumi – but on a warm evening, or at lunchtime, the mix of zingy flavours and protein from the quinoa would do just fine on its own. The recipe is here. Feta and greens is a favourite combination over at ETP Towers, so this ‘open’ omelette from chef Bill Granger over at the Independent is a winner for us. It shouts ‘lunch’ of course, but some hushed sweet nothings could tempt me to turn this into a brunch dish, especially with a little drizzle of chilli sauce. The recipe is here. Also over at the Indy is this rolled up omelette that gives us all something different to do with asparagus this season – the sweet and nutty spears chopped finely with spring onion. Not everyone will find the Nanami Togarashi chilli flakes that chef Mark Hix suggests, but I’m sure your common or garden chilli flak will suffice. The recipe is here. 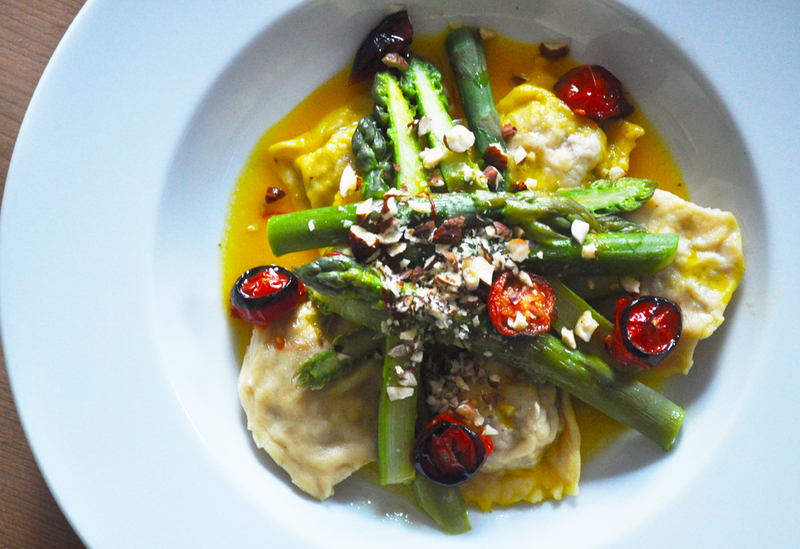 Sticking with asparagus, this recipe from Rose Prince at the Telegraph keeps it simple, highlighting that ‘Best of British’ asparagus, while adding a more substantial, even luxurious, touch to a light lunch. It’s rare I’ll eat puff pastry. It’s equally rare that I’d complain about having to. And here it is, a precious airy pillow on which those asparagus spears can rest. The recipe is here. Have you noticed how cauliflower seems to be making a comeback? Regular readers of Earth to Plate will know we love it here, but it’s good to see this often overlooked vegetable getting tome respect. It features here as one of three ‘small-plate’ mezze dishes by Yotam Ottolenghi: Fried Cauliflower with Pine Nuts, Capers and Chilli is followed by Honey Roasted Carrots with Tahini Yoghurt and Aubergine and Parsley Pesto. Just pass me some warmed pitta. The recipes are here. A few weeks ago I was asked about tofu: do you like it and what do you do with it? A few years ago I would have said I didn’t like it one bit, but all that’s changed. Why? Well, eating tofu in the Vietnamese restaurants of Kingsland Road and its environs in London, for one thing. And, also, wising up to the fact that tofu comes in differing textures: from ‘silken’ and soft versions to firm. Our ETP tofu cooking requires the bean curd to be knocked about in a pan so we look for the firm varieties. Sometimes we marinade it first and sometimes we don’t. Sometimes we chop it up into bite-size pieces and sometimes we slice a block into a large slab. Smaller pieces become more crispy when fried – good for throwing into soups and for dishes where there is a fair bit of sauce. The large slabs, while crisping at the edges, also retain a soft centre, which can make for an appealing contrast of textures. A distant memory makes me want to liken tofu in our dishes to pork crackling. But I could be wrong – all that is more than half a life ago. Below we have two recent examples of tofu dishes we’ve made. First, chopped to bite size, is an earthy tofu dish with broccoli, shiitake mushrooms and noodles. 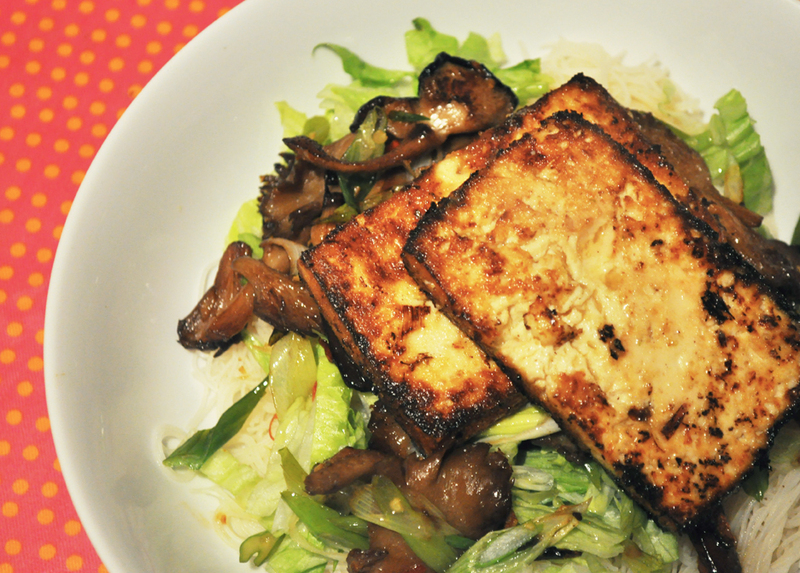 Below that is a fragrant marinated tofu dish with oyster mushrooms, salad and rice. There are some other ideas for tofu on this site too (you do use the ingredients list to search out recipes, don’t you?) 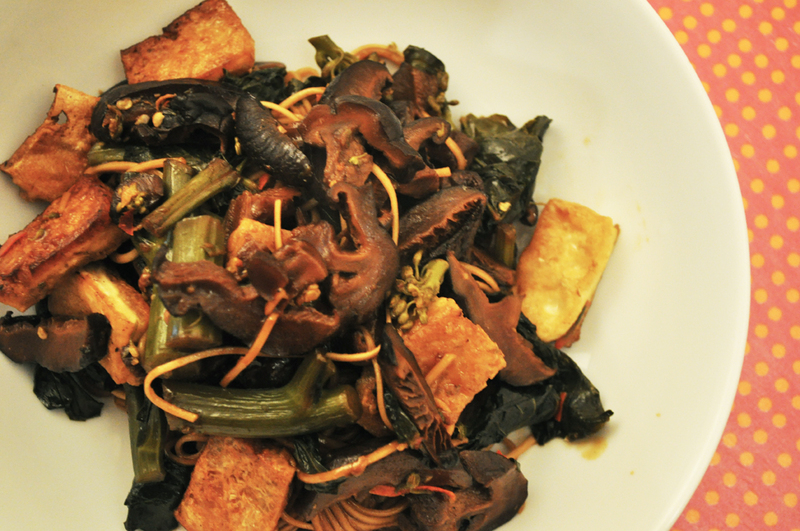 Have a look here, here and https://earthtoplate.wordpress.com/2011/06/18/last-nights-dinner-tofu-with-lemongrass-and-chilli/. Well, this recipe from the Observer Food Monthly magazine has ETP drooling somewhat. It’s a north African spiced chickpea dish that should be quite dry as there’s only one tomato used to add ‘sauce’ rather than a tin of them. But the novelty value, for us at least, is the filo and egg ‘brik’, which will add extra protein to the dish… as well as steering it well away from sounding healthy! Maybe that’s where the cucumber accompaniment comes in. Too late, cucumber, too late. In any case, as chef Parle says, it’s a concoction of some favourite things thrown together and yep, we’ll be making it. The recipe is here. Oh Brussels sprouts! Every Christmas it’s the same isn’t it? Everyone has them, everyone hates them. Well, actually, here at ETP Towers we rather like them. Recently, in fact, we’ve been eating them with pasta. 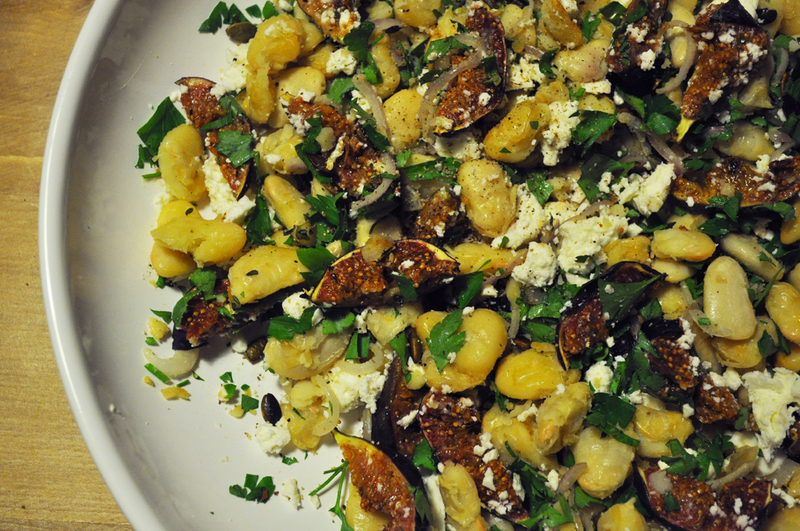 For New Year’s Eve, Ella decided to make this rather rich dish from goodly Cork chef Denis Cotter of Cafe Paradiso fame. The problem was, we were both rather ill and the heady combination of greens, blue cheese, roasted onion and soft, cheesy gnocchi felt too much for us. After doing half the prepping we called time and put the ingredients aside. Luckily we were feeling better the following day and carried on where we left off. It’s a great recipe and the combination of potatoes, greens and a cheese sauce, while hardly revolutionary, takes on some extra nuances through the choice and ways of cooking the ingredients. You want the recipe? Well, it’s not ours, it’s Den’s, so you’ll need to look here. Or you could have a go yourself. A creamy blue cheese sauce? A five-minute job. Roasted shallots? Get the oven on. Cheesy potato gnocchi? 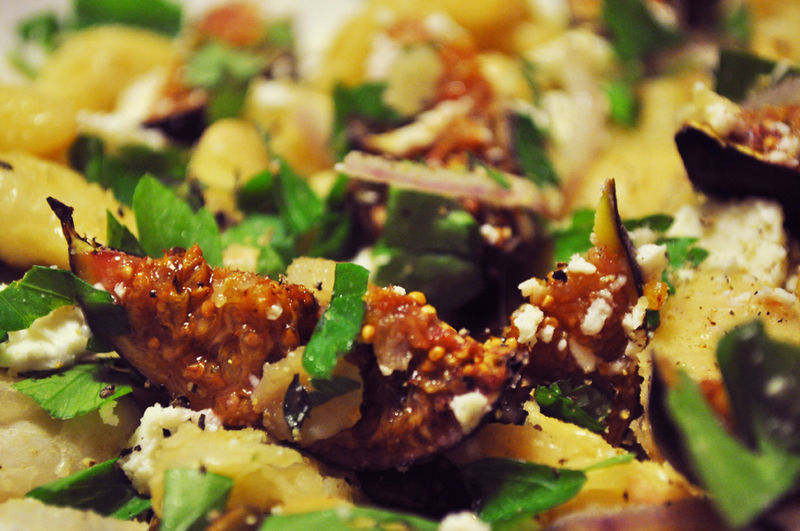 If you haven’t tried making gnocchi, look it up, it’s easy. And the sprouts? Just remember not to boil them. Cavolo Nero. How I love it. There are other leaves and, maybe even elsewhere on ETP, I’ve lauded their many charms. But that was then. This is now. It’s December. Midwinter. The nights are cold and dark. Cavolo Nero, black kale, is the leaf for today. We’ve done greens in risotto before, but I do like the look of this one from the Independent newspaper – with the addition of porcini. What a midweek wintery treat this is. Three Bs make this simple dish, which, I know, isn’t done justice by the photo (my camera battery died after just one test shot). Let’s pretend it’s a great shot and move swiftly along. Using pearl barley to make a risotto is a pleasant change from starchy rice. Usually we make it just the way you would in a normal risotto (for example, see here), but on this occasion we did something a little different, cooking the rice in stock on its own and making a separate sauce for extra flavour. The difference, here, is that the grains almost swim in the sauce rather than being bound together by it. If you like your risottos very loose then you’ll probably like this. This made enough for two. Cook as per packet instructions and use about the same amount of barley as you would risotto rice. We simmered ours in a light vegetable stock for around 25 minutes until the grains soften to just past the point when they’re chewy. While the barley is cooking, steam a bunch of purple sprouting or tender stem broccoli for four minutes then saute it for a few minutes in a little olive oil and with a clove of finely chopped garlic. Again, while the barley is cooking roughly chop a bunch of basil and place it in the jug of a blender/liquidizer with two cloves of finely chopped garlic. Add 300ml of single cream and blitz to make a bright green sauce. Gently heat the sauce in a small pan. When the barley is cooked, drain it and stir some grated parmesan (or other strong hard) cheese through it along with a generous nob of butter. To plate up, either mixing the broccoli through it or placing the greens on top. Pour the sauce around the edges of the bowl. Sprinkle some extra grated cheese on top. Serve immediately, or pause to take a bad photo of it, as we did. 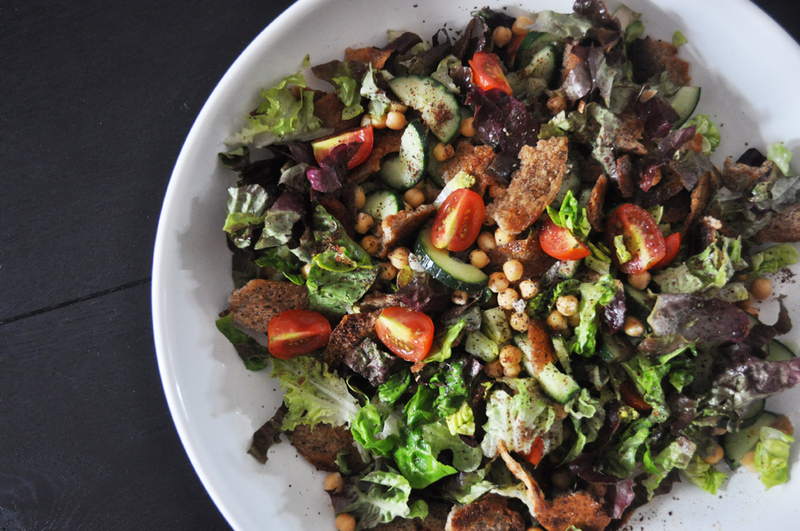 Fattoush is basically a bread salad from the Levant made from toasted or fried pieces of (stale) pitta bread. Added to it are herbs – flat leaf parsley and mint – and fresh vegetables including tomatoes, cucumber, red onion and even radishes. It’s often seasoned with sumac. Sometimes peppers, feta cheese, olives, carrot and lettuce are added. Really it’s up to you, but choose good fresh ingredients that are in season. You’ll notice that ours has some chickpeas in it. You’ll often notice that on ETP. It’s not quite trad in Fattoush recipes, but not really a heresy either. We lightly fry the pitta. Don’t blacken it. It will also continue to crisp up once you take it from the frying pan to cool, so don’t overdo it. The rest is chopping and assemblage. Don’t cut the vegetables too finely – you’re not making tabbouleh. That’s it really: a combination of fresh flavours and pleasing textures. A great lunch or light supper. Oh, and yes, we often have feta in ours. This one didn’t. Real-world followers will know this isn’t last night’s dinner but the dinner of 24 September. We had received a variety of squash in our weekly veg box that I didn’t recognise. Spaghetti squash, I thought, I bet it’s spaghetti squash. I was right. Spaghetti squash is so called because when it is cooked its flesh comes apart in strands rather than chunks or a straightforwardly mashed texture. Which is all very well, but what to do with it? First things first, I wanted to have some piquancy in the dish: half some cherry tomatoes, place them on a baking tray and cook them in the oven at a very, very low heat for anywhere between 2-3 hours. In fact don’t cook them so much as warm them, wither them, dry them out. With the moisture gone they are going to provide an incredible hit of tomato flavour. Promise. Right, onto the main event. Half the squash and scrape out the seeds with a metal spoon. Place the squash, cut side up, in a roasting tin, drizzle with olive oil, sprinkle over some salt and rub in a teaspoon of ground cumin to the surface of the flesh. Roast in the oven at 190 degrees celsius for 30-40 minutes or until the flesh is soft when you prod it with a fork. At this point remove from the oven and leave to cool for a few minutes so the squash can be handled. Then, with a fork, start lifting the flesh from the skin, pulling it away gently. Those spaghetti like strands should start to appear. Spread the flesh loosely over the bottom of a baking/casserole dish. While the squash is cooking, sautee an onion in a little olive oil in a deep frying pan. When it has softened, after five minutes or so, add a chopped courgette and a chopped fresh red chilli. Stir and cook for another five minutes. Then add two tins of chickpeas. Stir again. Take a small pinch of saffron strands and infuse them in 500ml of vegetable stock for five minutes (you’ll need to ensure the stock is hot). Add the saffron stock to the chickpeas, onion and courgette. Sprinkle a level teaspoon of ground cinnamon into the pan and a teaspoon of ground cumin. Stir and simmer for 20 minutes. If the mixture completely dries out, add a splash of water to loosen it. 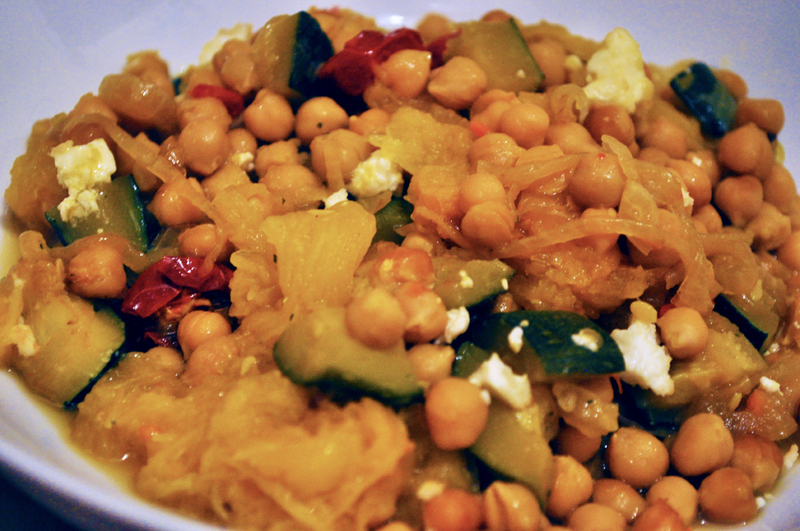 When done, spoon the chickpea mix over the spaghetti squash in the casserole dish, letting the juices soak into the squash. Dot the oven dried tomatoes into the topping and break some small pieces of feta into the mix too. Bake in a medium oven for 10-15 minutes.